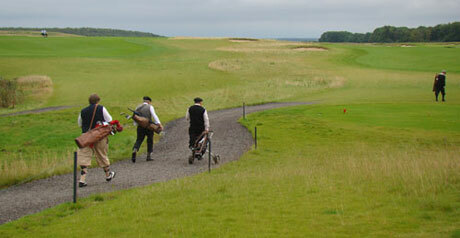 Golf almost alone among major sports traces its lineage back hundreds of years. Most of that time was spent playing with wood shafted golf clubs. The links listed here are devoted to perpetuating and enlivening the sport's rich heritage. Enjoy with us through these sites the explorations of our sport and the unique traditions that hickory golf enthusiasts support. Know of a resource that should be listed here? Drop us an e-mail. The British Golf Museum Where better to find out about golf than in St. Andrews, the home of golf? Using diverse displays and exciting interactives, the Museum tells the story of British golf from its origins in the middle ages through to the present day. Golf Club Atlas For years the Golf Club Atlas has served as a tremendous resource with some amazing photos and great historical content. Historic Golf rules www.ruleshistory.com. Want to know the rules of golf for a certain period? This site will tell you all! A magnificent compendium put together by John Hutchinson. Golf Historical Society of Canada We know about hickory golf clubs, we play with them, we collect them, we learn about them. Persimmon Golf Today Yes, it's about persimmon golf and includes golf's later, classic era of Hogan, Snead and Nelson. But persimmon golf also includes the hickory golf era. The site is rich with history, photos, commentary and insights into the playing of golf with persimmon headed woods. Golf Historian – The site of David Joy Discover the warmth and depth of the Grand Old Man of Golf, Tom Morris Sr. through the historian David Joy. Through text and video, Joy brings to life one of the central figures of golf's pioneering history.